Use duct tape! This DIY dress form can be of great help when making your own clothes, particularly during hemming and fitting. 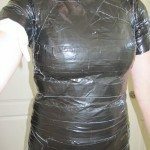 And if you have friends or family that you plan on making clothes for, you can make their own duct tape dress form so that you have a better look at how the dress is going as you finish it! Do you know someone who will love this idea? Previous articleScariest Halloween home decor ideas to frighten your neighbours and visitors! Next articleMake your own pompom rug!